I stumbled across this ‘different’ recipe for slaw salad in a grocery store flyer. There’s no mayonnaise, traditional white vinegar, paprika, celery seed or some combination of these ingredients. The garlic gives the salad some bite, and a smoky flavor. The cilantro brightens the whole salad for a fresh feeling. After several tries, I discovered the slaw needed more garlic (but I love garlic). And while we’re boosting the flavor, why not add a little fresh green onion. Upping the quantity of cilantro also works. To make the dish even easier for busy cooks, let’s use some prepackaged slaw to save time. Fresh Express’ 3-Color Delie Cole Slaw is more than adequate to the task. This alternative slaw is delicious and good as a side or fun to try on your homemade deli-style sandwich concoction. In a skillet heat olive oil until shimmering. Add garlic and onion, reduce heat, and cook until garlic becomes light brown: about three minutes. Set aside. In a small bowl combine white wine vinegar, lemon juice, salt, and pepper: whisk together. Add oil, garlic, and onion mixture and whisk again. 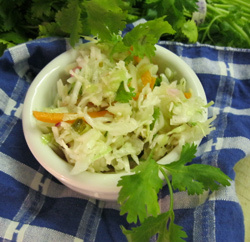 In a large bowl, put in 1/2 bag of slaw mix; add 1/2 of the marinade and toss together. Repeat for the additional slaw. Refrigerate for 1 hour, better if overnight. Prior to serving, add cilantro and toss well. Add additional salt and/or pepper to taste.